Capnography can be an addition to a paramedic’s toolkit. A recent survey taken of EMS1 readers indicated that upwards of 95 percent agree that capnography is easy to understand and an important monitoring tool for patients in cardiac arrest, experiencing respiratory distress, or ill with sepsis among other things. Capnography is the measurement of carbon dioxide in a patient’s exhaled breath over time. Commonly used during anesthesia procedures, capnography is increasingly being used by paramedics in the field for a variety of purposes, including the evaluation of the success of resuscitative efforts, the confirmation of clinical death, and the analysis of the causes of respiratory distress. One of carbon dioxide (CO2 )’s properties is that it absorbs infrared radiation. When the patient exhales, a beam of infrared light is passed over the gas sample on a sensor. The presence or lack of CO2 , is inversely indicated by the amount of light that passes through the sensor. High CO2 levels are indicated by low infrared, whereas low CO2 levels result in high amounts of light. The CO2 levels are then displayed on the detector and adjusted for the presence of nitrous oxide, which can also absorb infrared rays and thus can cause some confusion if not accounted for. What is measured by the capnograph is known as the End Tidal CO2 (ETCO2) or the amount of (or partial pressure of) the carbon dioxide released at the end of expiration, which is essential for assessing cardiac output. 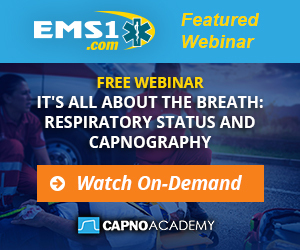 Why is capnography so important? CO2 levels in the blood are incredibly important for proper oxygenation and metabolism, which is why capnography is so useful. An irregular amount of CO2 in a patient’s breath and the degree of that irregularity can tell health care providers a great deal about the condition and treatment required. In hospitals, capnography is traditionally used during anesthesia, where it monitors metabolic processes through CO2 levels, both expired and arterial. In an EMS setting, capnography has a multitude of uses. ETCO2 levels are highly indicative of the effectiveness of chest compressions during CPR, and can be the first indicator of a return of spontaneous circulation. Furthermore, capnography can be used to analyze the causes for respiratory distress in patients, including asthma, chronic obstructive pulmonary disease, or bronchitis. It can also provide early warning signs of hypoventilation or airway obstruction before any changes are seen in a heart rate or blood pressure monitor. Capnography is an incredibly effective way to identify reduced perfusion, since ETCO2 levels can also provide early warning signs of shock. And finally, capnography can also provide a way to decide when resuscitation efforts can reasonably stopped – in other words, certain ETCO2 activity levels can serve as a confirmation of clinical death. Capnography can tell us a great many things about the human body’s functions in an emergency situation and it can often do so before any other measurement. As its utility expands beyond just hospitals into a pre-hospital emergency settings, its advantages become increasingly clear, and it becomes easier to consider capnography as the valuable tool that it is for EMS.